Colorado State Parks offer you many miles of hiking trails, along with plenty of opportunities for camping and picnicking. Strangely enough though, of the forty three state parks in Colorado, only a few of them are good hiking parks. Those are the ones I will be focusing on here. Before heading into any of the state parks in Colorado, you might want to know about the state park pass. It’s an annual pass that costs you $70.00 (in 2017), and gives you access to all of the forty two state parks, and is valid for 12 months from the time that you buy it. The cost for the daily pass ranges from $7.00 to $9.00 depending on the park, and it gives you access to the park for that day and through noon the next day. As I mentioned in the first paragraph, only a few of the parks have enough trails to be considered good hiking parks. 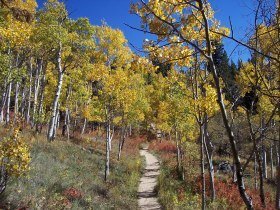 The two best known hiking parks are Golden Gate Canyon State Park and Mueller State Park. Lesser known of the state parks in Colorado (as hiking parks) are Lory State Park and Castlewood Canyon State Park. In addition to the above parks, I will also be sprinkling in some information about hiking trails in some of the other state parks in Colorado. These will include parks such as Steamboat Lake, Roxborough, Eldorado Canyon, and State Forest state parks, among others. These parks have fewer trails and I will pick out the ones I think you might like best. Camping at the state parks is another popular activity. Most but not all of the state parks have camping facilities and some of the parks even have cabins and yurts. A yurt is a round, domed portable tent and is tall enough to stand in. Each one comes with a ceiling fan/light, a round table, and space for preparing food. The yurts can hold 6 people which makes them ideal for family groups. Another activity you can enjoy at the Colorado State Parks is picnicking. Nearly all of the parks have picnic tables and of course, the staff do their best to put them in scenic locations. Return from Colorado State Parks to Colorado Hiking Vacations home page.